BillHustonBlog: Rescheduled Energy Planning Board Meeting THURSDAY! Rescheduled Energy Planning Board Meeting THURSDAY! WHEN: THURSDAY June 25th. 1pm. WHY: First meeting was abruptly cancelled. 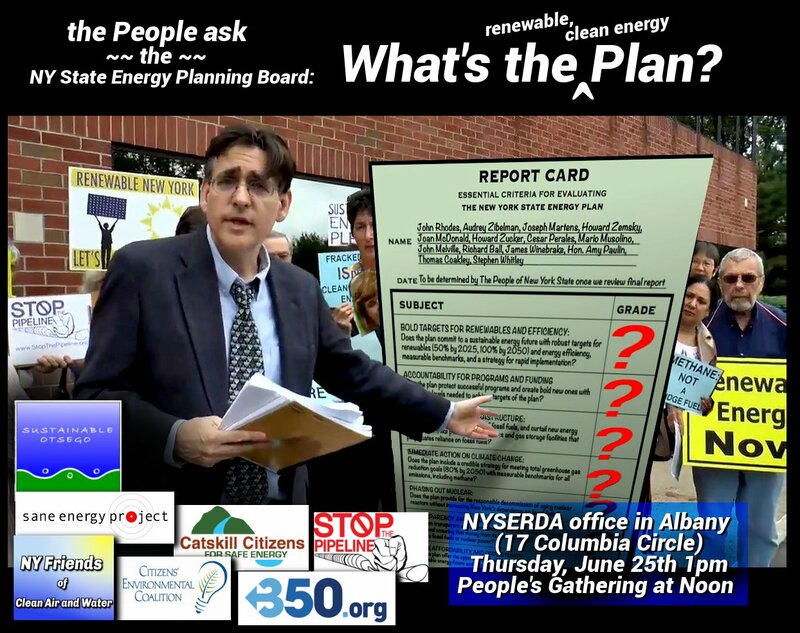 We recently learned that the New York Energy Planning Board is holding a public meeting on NEW DATE: THURSDAY, June 25th, 1:00pm at the NYSERDA office in Albany (17 Columbia Circle) to discuss the New York State Energy Plan which will soon be released. This is the first meeting of the board since January 2014 when the draft plan was issued for public comment. I strongly encourage everyone who is interested in the future of energy in our state to attend. I believe--and I know you do too--that the threat of climate catastrophe to the world that our children will inherit creates a moral obligation for us to do everything in our power to rapidly move away from the continued burning of fossil fuels. I also know that, despite the anticipated ban on high-volume fracking, many of you have not had a moment's rest because you are fighting day in and day out against an overwhelming and ACCELERATING onslaught of gas infrastructure projects across New York including pipelines, compressor stations, power plants, and gas storage facilities. Those projects not only threaten our communities and public health; they collectively contribute to the demise of our state, our nation, and our planet. It is important to recognize that the soon-to-be-adopted NYS Energy Plan is the official blueprint for our state's energy future as mandated in statute. It is intended to drive state policies and programs, as well as permitting decisions by state agencies. This makes the plan of pivotal importance to all of us. The bottom line is if that blueprint predicts the need for more gas pipelines and power plants, then that is what we are likely to get. Many of us rightfully criticized the draft energy plan last year because that is precisely what it did. Despite deceptively pretty pictures of solar panels and wind farms in Volume 1 of the plan and ambiguous goals about "clean" energy, the draft predicted a growing need for gas, advocated the massive expansion of gas infrastructure, and offered only vague lackluster support for renewables or improvements in energy efficiency. For example, in 2012 only 20% of our state's electricity came from renewables, almost all of that being hydropower. Shocking, the draft plan projected that the percentage of our electricity in 2030 will STILL only be 20%. Furthermore, the "plan" predicted that fracked gas would need to comprise a much LARGER percentage of our energy portfolio than it does today (and a whole lot more if a nuclear power plant closes). This paints a terrible, defeatist picture for the future of our state, which many of us insisted must be dramatically altered. And disturbingly, the draft plan has already been used by industry to justify more gas infrastructure. The message that many of us delivered in comments and at hearings was that instead of passively reacting to business-as usual forecasts of greater dependency on fossil fuels, New York must aggressively set forth a REAL PLAN that charts a very different course with SPECIFIC and SIZABLE targets for renewables and energy efficiency, coupled with a well-defined strategy for HOW we are going to get there. So what I will be looking for on THURSDAY is whether or not the revised energy plan actually does that. If it does not, then it is not worth the paper it is written on. By the way, the target that many of our organizations called for was 50% renewables by 2025. Similarly the draft energy plan gave only lip-service to a goal set by former Governor Paterson of reducing total greenhouse gas emissions 80% by 2050 from all sources, while offering no plan for getting there. The only pseudo-target mentioned was a economically-adjusted 50% reduction in carbon dioxide emissions by 2030, which ignored methane completely. Again, this conveniently supports a gas agenda, locking us into a future where there will be no possible way of actually achieving total GHG reduction goals. What we need to see is a plan that includes scheduled benchmarks for reductions in all GHG emissions (account for the full life-cycle of methane, using credible estimates of leakage, and applying the most current IPCC 20-year global warming potential). Needless to say, as with the draft version of the plan, we should all know that the devil is in the details and it is far too late in the day for us to take comfort in pleasantly crafted, but damningly vague verbage about "clean and green". Little information has emerged from NYSERDA about Thursday's meeting, however what we do know is that a presentation on the revised plan will be made. Prior meetings of the board have been carefully controlled and polished without opportunity for formal public comment, so that could be the case Thursday too. It is also unlikely that we will be given a copy of the document in advance so that we can see those important details, or lack thereof. Nonetheless, we can fill the room and make ourselves seen and heard--forcefully but respectfully-- in all the ways that we know how. The Energy Planning Board consists of the head representatives for almost every state agency. So in my view, this is an opportunity not to be missed for all of us fighting gas infrastructure across New York to bear witness, talk directly to the agencies that are making decisions about our future, show them that we see the big picture, and insist on real change that requires a real plan for the future. p.s. The following link contains comments that Otsego 2000 submitted on the draft energy plan last year. Section 4 relating to fracking on NY soil may be outdated, however all of the other 14 sections relating to the future of energy use, climate change, the negative impacts of gas infrastructure, and the morally destitute policy of "frack your neighbor" are more applicable than ever.